Some of the most comfortable shoes ever! In today's hectic world full of business deals and cafe-latte's, the immediacy of the always-on call culture can be draining. Fortunately, Hey Dude looks set to single-handedly make us take a step back and enjoy the perks of living in the slow lane. 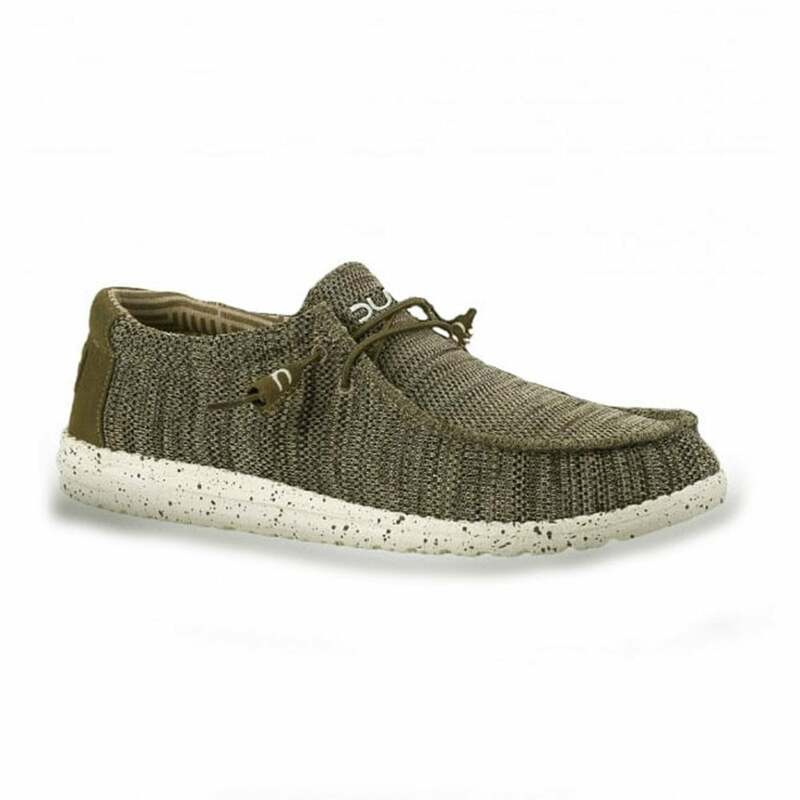 Combining the comfort and light weight of slippers with the functionality and versatility of trainers, once you get the Hey Dude Wally Sox mens shoes on your feet, you'll never want to take them off. The upper canvas uppers of the mens Wally Sox casual shoes have a lived-in, vintage appearance. Small, stitched details give the illusion of repair and adds to the distressed design of the Hey Dude Wally shoes, while three breathable eyelets on the instep reinforce the link between the laid-back style and comfort construction. With elasticated panels on either side of the tongue and heel, the slip-on Wally Sox shoes provide an easy and custom fit. Adding a discrete touch of decoration in keeping with the Wally Sox simple styling is a small rubberised tag, carrying the Hey Dude branding, on the shoe topline and bottle shaped pin on the right foot. The sole unit of the Hey Dude mens shoes is where all the magic happens; guaranteed to offer the amazing feeling of walking barefoot, the Flex & Fold technology offers incredible comfort and freedom for your feet, making for an ultra flexible shoe that adapts perfectly to you and your needs. The speckled white Dupont outsole is made from a resiliant resin that is slip-resistant and anti-bacterial to prevent odours, while also absorbing the impact of every step. Inside, the Hey Dude Wally Sox has an insole that can be removed and is perforated to allow air to circulate around the foot. A wonderful casual canvas shoe, the mens Wally Sox from Hey Dude are sure to change the way you walk and no shoe will feel the same again. These slip-on mens shoes are some of the most comfortable you will ever own, and every man should get themselves a pair today!